E'vans Bake Shop opened its’ doors in Downtown East Point in 2008. 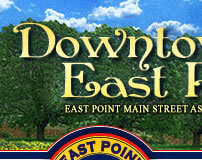 The owners, E'van and Alfonza Lucas, chose Downtown East Point after the City was referred to them by friend. E'vans Bake Shop makes their homemade sweet treats fresh every day. They pride themselves on offering clients an assortment of cakes, cupcakes, cookies and pies using only the highest quality and freshest ingredients. The bakery is proud to say that they have built up a large following of regular customers thru the years. They feel their desserts “Taste So Good” that they will keep you coming back for more! "Here at E'vans Bake Shop in East Point we bake our sweet treats from scratch each and every morning! Our sweet assortment of cakes, cupcakes, cookies and pies are baked inhouse, using only the highest quality and freshest ingredients". E'vans Bake Shop actually originated from a church fundraiser. The couple baked sweet potato and pecan pies for the fundraiser and it was a huge success. The pies were so popular that the couple decided to turn their success into a full-time business, which has been rewarding for them. 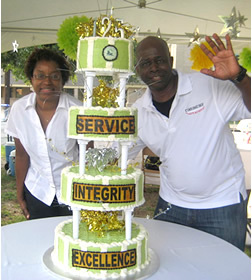 Some of their most popular signature items are the triple chocolate cakes, strawberry delight cakes and their famous key lime cake. Give them a try!